The Scene: a blustery day in August. 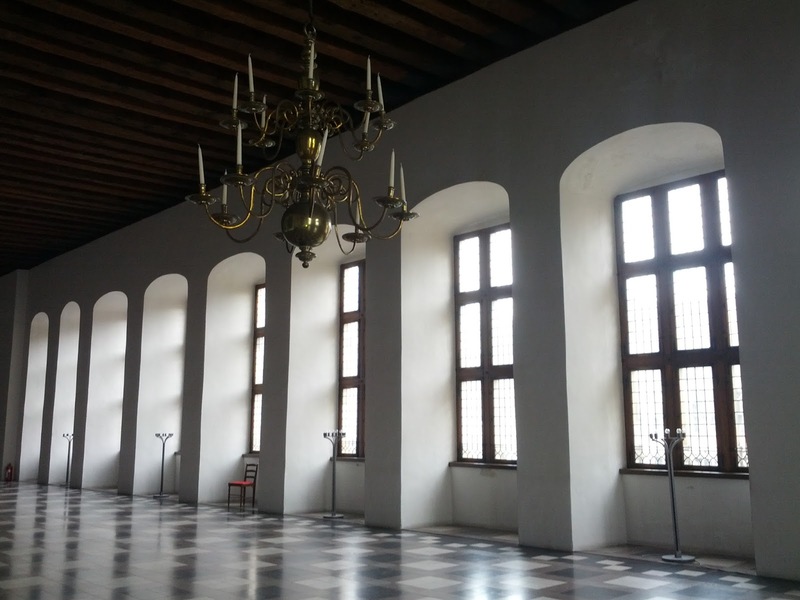 The Place: Kronborg Castle, Helsignør, Denmark. 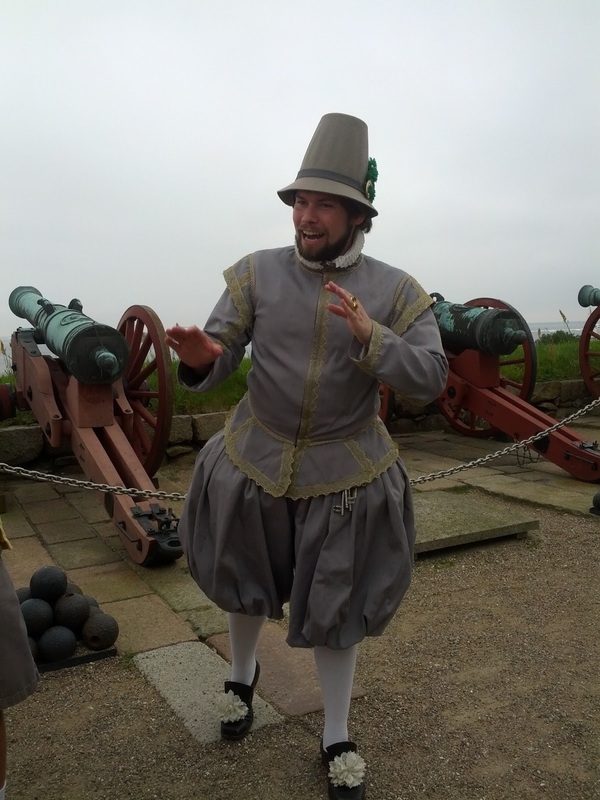 The Player stood at the ready in the courtyard, in period costume. 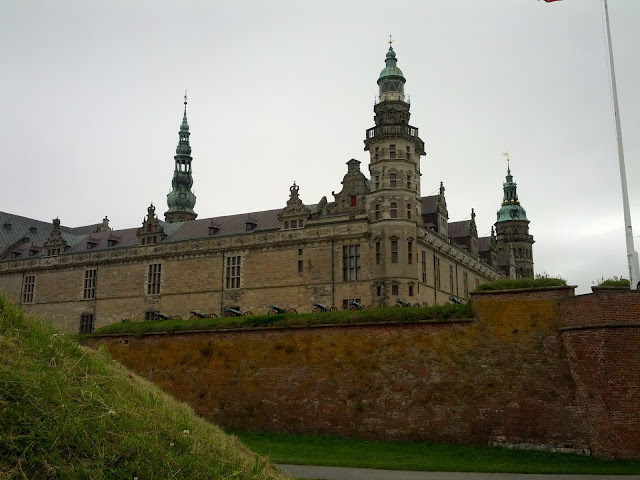 And thus began our guided tour of Kronborg Castle, led by none other than Horatio, friend of Hamlet, Prince of Denmark. Horatio introduced himself to the group humbly as Hamlet’s servant, though he told us the Prince considered him to be a most trusted friend. He led us out of the courtyard to overlook the Swedish sea. 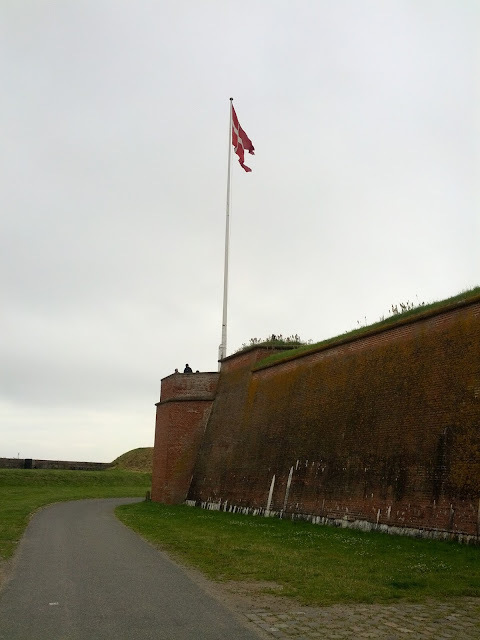 The row of heavy canons stood in their defensive position while the Danish flag flapped proudly in the salty wind behind us. It was there, Horatio told us while pointing to the flag, that he first heard of a ghost appearing late at night. The grey weather was indeed a strong supporting player in this performance as it added a sense of foreboding around the castle grounds; it wasn’t at all difficult to picture a ghost appearing nearby. Our guide then beckoned us to follow him underneath the castle, to a dark, dank, chilly corridor lit by real lanterns. There, among the old piles of stones and the flickering light, Horatio told us how Hamlet insisted those who’d seen the ghost and heard its lament swear not to reveal its tragic secret. His sudden shout of “SWEAR!” shattered the hushed calm and sent a loud echo that clanged off the stone walls, making us all jump and shiver from the sudden goosebumps that spread across our necks. It was a great moment that pulled us even further into the intrigue of the story. As we wound ourselves through the castle’s dimly lit underbelly, Horatio explained how Ophelia, Hamlet’s love, had tried to follow them through these very passages and eavesdrop on their urgent discussions. Hamlet already had doubts at this point over who he could trust and angrily dismissed Ophelia, telling her to ‘get thee to a nunnery’. We suddenly found ourselves blinking in the daylight outside the castle once again. Near the gates, Horatio pointed out the place where he and Hamlet greeted the troupe of players and briefed them on his plan: “The play’s the thing, wherein I’ll catch the conscience of the King”. He ushered us into the castle’s beautiful, ornate chapel, where Claudius, deeply shaken from the play’s performance, prayed to God. Horatio indicated the large stone pillars where Hamlet hid and watched his uncle confess but upon hearing his admission of guilt, he could not bring himself to kill him there, in God’s house, for he would surely be damned for all eternity. He then brought us to the chambers of the Queen. This was the place, he told us gravely, that Hamlet confronted his mother. As we peered through the narrow doorway into the chamber, our attention was drawn to the large hanging tapestry…it was behind there Hamlet noticed a figure lurking and eavesdropping...surely it was Claudius, the murderer! However, the figure was revealed to be Polonius, who tragically met his end there, stabbed through his hiding place by his daughter’s lover. This moment was one of my favorite of the tour as there was a brilliantly timed thud from within the room, like that of a lifeless body hitting the floor. It brought a terrific feeling of being inside the story as it was unfolding. We followed Horatio to another small chamber where he had the unfortunate duty of helping Hamlet stash Polonius’ body. We paused in the hallway, next to some tall gilded windows where Horatio told us of a strange conversation they had with some gravediggers about a skull…but there was little time to dwell on this, as word came that Laertes, Ophelia’s brother, had challenged Hamlet to a duel over his sister’s recent suicide following their father’s death. I was reminded again at this point just how many bodies this play leaves in its wake. Finally, we reached the Great Hall, were the climactic duel between Hamlet and Laertes took place. It was a grand room, with a smooth, polished stone floor, tall windows, and dangling chandeliers. Horatio’s tale picked up speed as he relayed the highlights of the duel: the unexpected points Hamlet scored, the poisoned foils and the King and Queen both dying from poisoned drink. His voice was full of emotion as he told us how as Hamlet lay dying and Horatio himself was prepared to follow his friend into the afterlife, the Prince made him take one more vow – to share the tale of what really happened here at Helsignør, to dispel the rumours and to keep his memory alive – hence his reason for taking us on the tour. The In Hamlet’s Footsteps Tour was a fascinating theatrical experience. The Horatio character makes the story quite accessible to those who aren’t familiar with Shakespeare’s play - it’s basically an ‘essential plot-points’ version. 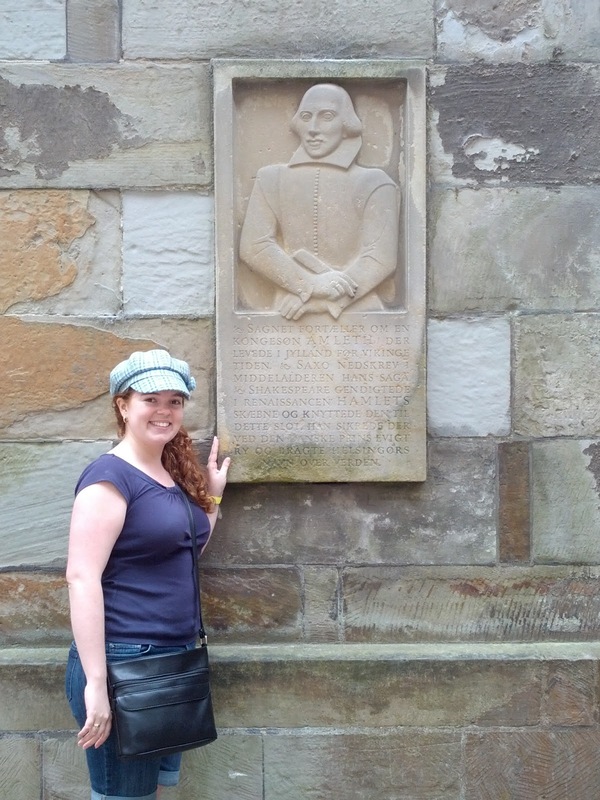 For those who have studied or seen Hamlet before (as I have – three different times), it was exciting to experience the story in its inspired setting and to anticipate where in the castle we’d go next.